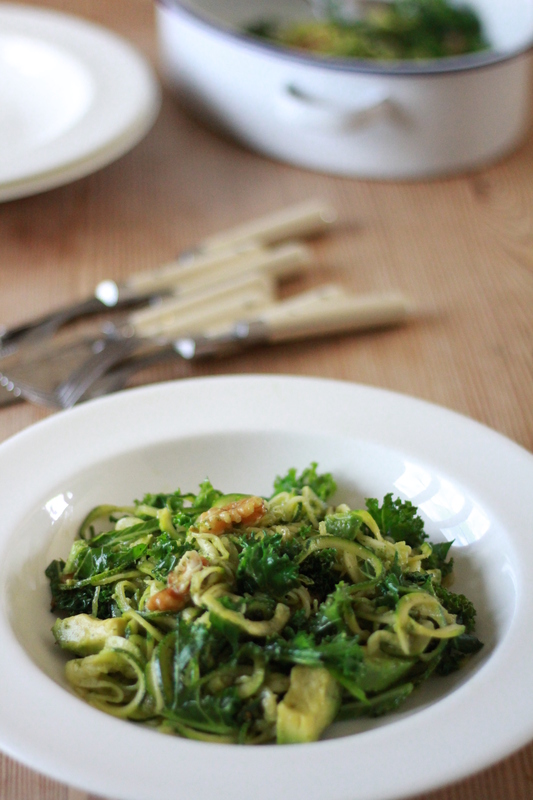 I didn’t plan to blog this superfood salad of Kale, Courgetti (Zucchini noodles) Avocado and Walnuts dressed in my Brazil Nut and Fennel Pesto, I thought it was too simple. That was until my friend Soraya came for lunch. She loved it. So much so she went home that night and made it again! Now my friend Soraya is not someone who messes around, so if she says you must share this, you don’t argue and hey I was pretty flattered she loved it so much. And simple ingredients and recipes is what I always wanted this blog to be about. Like so many things the magic can often be found in the simple things. I recently read that life is like the movies, 90% of its success is in the casting, who you are exposed to and who you surround yourself with. This really resonated with me. I’m a great believer that we are all the authors of our own life (experience). Often it’s really easy to be swayed by what others think and we can spend too much time with people who leave us feeling drained of energy or even bad about ourselves. It can be hard to remember we have a choice. I first met my great friend Soraya 29 years ago (it feels unreal to be even typing that number) on the first day of school. A friendship I’ll forever treasure. I’m especially grateful to Soraya as when I was ill she tentatively mentioned a book written by Louise Hay. In any ordinary circumstances I would have run of the hills, but Soraya isn’t an airy fairy type of person and I knew it was something I needed to explore. It changed my life and lead me the amazing work of Gabby Bernstein. I had of course previously heard of mindfulness but I have to admit it sounded (to me) quite boring, even a little soulless and maybe a bit like hard work. Reading Louise Hay and Gabby Bernstein showed me how simple shifts in how we perceive ourselves and lives can radically change the outcome of them. Without reading these books I’m not sure I’d have had the courage to start this blog. So thank you Soraya, Louise Hay, Gabby and to all my great friends who continue to support me. Anything is possible, we just have to believe it. A fresh green super food salad, bursting with sweetness, flavour and goodness. Heat the coconut oil in a pan and add all your ingredients. Gently stir through for 2 mins. Season with your salt and pepper to taste. Notes: This salad can be enjoyed warm or cold and will keep well covered in a fridge for up to 24 hours. It makes a great portable lunch to enjoy in the office or out and about. Whizz all the ingredients together in a food processor. 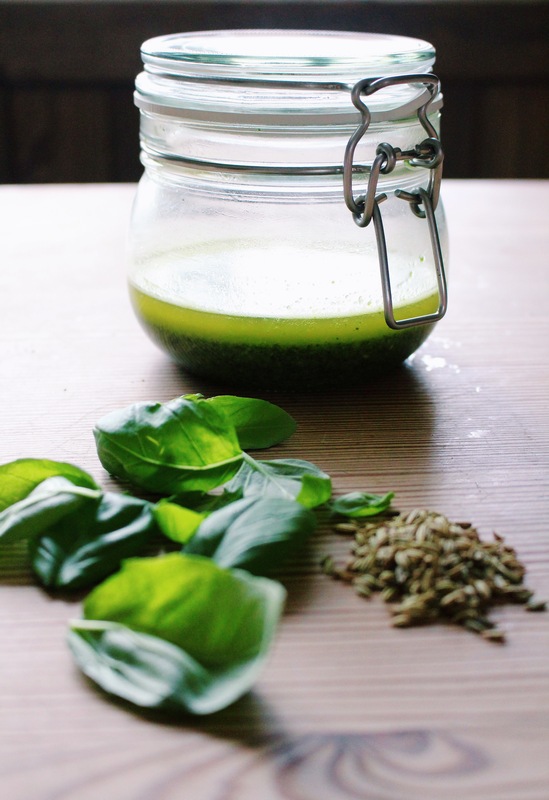 Taste and add more oil if you prefer a thinner pesto. Hey Pesto! Notes: This pesto keeps beautifully covered in a fridge for up to 7 days. What a super sounding recipe and as you say the simple ones are always the best! Your friend sounds amazing. I am trying to practice 10 minutes of mindfulness or meditation every morning so am checking out your recommendation on books. Thanks for that! Thank you Vicki. I’m trying to do the same/yoga every day too. This looks so tasty! I hadn’t ever heard of a courgette prior to reading your post and am definitely going to have to try them out now! Ah they are Zucchini. I should of noted that 😊. So hopefully super easy to find. I’ll edit this now. Thanks for the pointer.